[masterfoo]’s mother-in-law suffers from a bad hip which would have sidelined her participation in the Fourth of July festivities. As a testament to the power of family and ingenuity, [masterfoo] built her a beach-capable wheel chair to give her some off-roading capability. The frame is built out of 1.5″ PVC piping and the tires are 20×8-8″ inner tubes for ride-on lawnmowers. The lawnmower wheel inner tubes were cost-effective and fit the purpose, saving the need for the more expensive purpose-built-for-the-beach Wheeleez tires. They also have a fluid inside that plugs small punctures which will come in handy against he beach’s small cacti and other flora. This video was their guide for the foam insulation and plywood wheel assembly, also employing the handy man’s secret weapon to protect the tube from the rim’s plywood edge. Check it out in action! We’ve never seen someone build a plotter out of buzzwords, but [roxen] did a really good job of it. The idea is simple, place the plotter over a sheet of paper, open a website, draw, and watch the plotter go. Check out the video below the break. The user draws in an HTML5 Canvas object which is read by a Java Web Server. From there it gets converted to serial commands for an Arduino which controls the steppers with two EasyDrivers. The build itself is really nice. It perfectly meets the mechanical requirements of a pen plotter without a lot of fluff. The overall frame is T-shaped, for the x- and y-axis. The movements are produced by two steppers and acetal rack and pinion sets. The pen is lifted up and down by a hobby servo. If you’re into developing your own photographs you might try mixing your own emulsion. [Jimmy Hartnett] worked out the chemical reaction necessary to make a photosensitive medium using Silver Chloride. His process lets him manufacture canvas that can be use like photo paper. The gist of it involves coating the back of a canvas with Gesso to prevent the emulsion from passing all the way through. He then floats the canvas face-down to apply the emulsion and skims it with a straight edge before it has time to set. 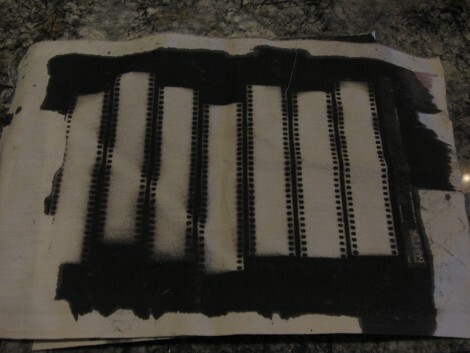 You can see the results of some contact print testing in the image above. If anything, this makes a great piece of art to hang on the wall as it’s visually interesting and [Jimmy] has a personal connection because he not only made it himself, but came up with the process.